This cheesecake recipe calls for a graham cracker crust, which is an American twist on the European pastry crust. 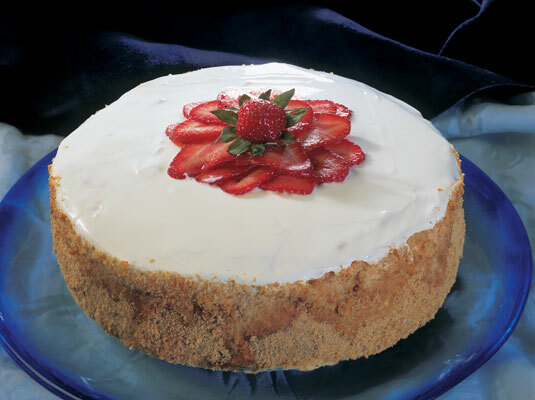 The recipe tops this cheesecake with sour cream frosting, which makes a tart contrast to the sweet and creamy center. Grease a 10-inch springform pan or regular 10-inch cake mold with the pat of butter. Place the graham crackers in a plastic bag and crush them into crumbs with a rolling pin. Place 1/2 cup graham cracker crumbs in a bowl. Stir 2 tablespoons melted butter and 1 tablespoon sugar into the graham cracker crumbs and blend well. Coat the cake mold evenly with the graham cracker crumbs, including the sides of the mold. Pat the crumbs with the back of a fork so that they adhere to the cake mold. In a bowl, blend the cream cheese and lemon zest and mix until the cheese is very smooth. If you leave lumps at this point, they’ll show up in your cheesecake. Add 1 1/4 cups sugar gradually while mixing. Add the eggs, one at a time, to the cream cheese mixture. If you’re using an electric mixer, it should be on medium-slow speed and running the entire time. Stop occasionally to scrape down cream cheese that clings to the side of the bowl. Add the heavy cream while mixing and then add the milk. If anything sticks to the side of the bowl, scrape it down into the mixture. Pour the batter into the prepared pan or mold. To check for doneness, tap the edge of the mold — if the whole cheesecake moves as a unit (not in waves), it’s done. Rinse a knife under hot water and run it around the perimeter of the mold. Cover the cheesecake with plastic wrap. The plastic wrap prevents the cheesecake from sticking to the dish. Place a flat dish over the cheesecake mold. The dish shouldn’t slope on the sides. Turn an oven burner on low. Place the cheesecake mold on the burner and move it constantly. Don’t leave any plastic wrap extending over the edge of the cake mold to prevent burning. This step melts the butter that coats the pan to loosen the cheesecake. Hold the flat dish against the mold tightly and, in one swift movement, flip the cheesecake so that it transfers to the flat dish bottom-side up. Remove the mold from the cheesecake. Place your serving plate on the new top of the cheesecake (what was the bottom in the mold). In one swift movement, flip again. This step transfers the cheesecake from the flat dish to the serving plate. Combine the sour cream, 2 tablespoons sugar, and confectioners’ sugar in a bowl and stir well with a wooden spoon. Spoon the frosting onto the center of the cheesecake. Using the back of the wooden spoon, spread out the sour cream in concentric circles, making sure not to press down onto the top of the cheesecake. Pressing down could mar the surface and result in uneven frosting. Cut the cheesecake into 10 slices with a sharp knife.